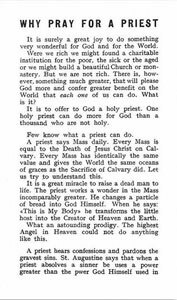 Home :: Religious Articles :: Leaflets :: Leaflet - Why Pray for a Priest? Leaflet - Why Pray for a Priest? God's chosen ministers are especially deserving and in need of our prayers. This leaflet shows what each one of us can do and especially what Christian Mothers can do!